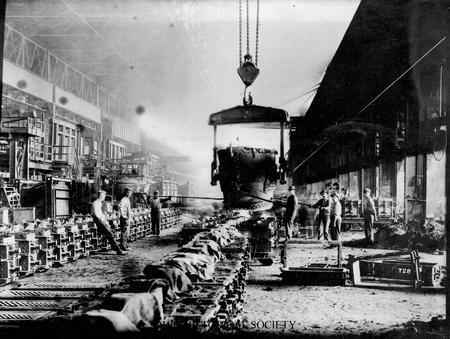 Modern print made from glass plate negative of employees gathered around a ladle that poured hot metal at the Buckeye Steel Castings Company in Columbus, Ohio, ca. 1912-1919. In 1881, Buckeye Steel Castings began producing iron castings in Columbus, Ohio. The company struggled until it shifted its product to automatic car couplers for railroads. The firm quickly grew, primarily due to the demand for its couplers as well as the lack of major strikes. Company workers appreciated the firm's attempts to establish various benefit programs, including a dispensary, a hospital, washrooms, kitchens, and locker rooms. Buckeye Steel Castings also supported a company baseball team and provided the workers with life insurance in 1917. Despite these programs, the work remained difficult and dangerous. In 1902, the company switched from manufacturing iron to steel couplings. By 1916, Buckeye Steel Castings claimed to be "the largest steel foundry in the world" to produce steel castings for railroads. Samuel Bush, President George Bush's grandfather, was president of Buckeye Steel during this time period. Throughout the twentieth century, Buckeye Steel Castings Company specialized in railroad parts, especially coupling mechanisms and the entire undercarriage of railroad cars. The Buckeye Steel Castings Company closed its doors due to insufficient capital in the early 2000s. A new firm purchased the company and renamed it Columbus Steel Castings Company. This company continues to manufacture railroad-car undercarriages and employs approximately five hundred workers.